In this newsletter we are sharing some interesting information about the composition of this very active albertapatients community. 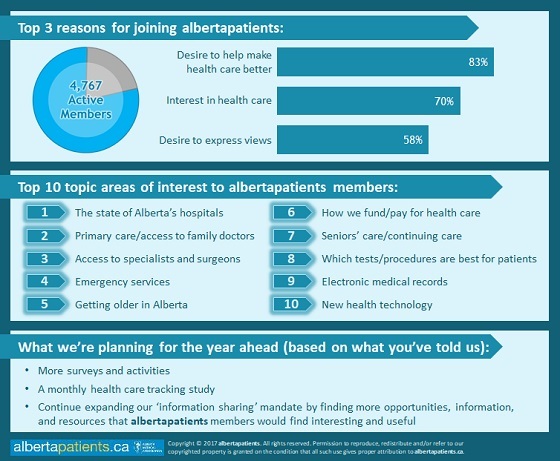 We’ve got some statistics to show you about who spends time in albertapatients, their reasons for joining and what’s on their minds. It’s no surprise to me to see that the number one reason for joining is to help make the health care system better. That is a goal that Albertans and your physicians share. We can take enormous pride in the great things that the system does, but we can also look for ways to make it better in terms of quality, access and efficiency. With system partners like Alberta Health and Alberta Health Services, the AMA is working to improve the system in a number of ways. For example: Doing a better job with health information so that it follows the patient through the system and also helps physicians improve the way we practice; giving you, the patient, more access to your own health care information; integrating primary care with hospital and specialist care so that patients can move back and forth without any gaps or confusion; doing a better job of aligning how physicians are paid with the needs of the patients they serve. The AMA Board of Directors will be working toward these objectives and more and will be eager to know what Albertans think about many related topics. We look forward to the year ahead and the conversations that will be happening in this albertapatients community. Thank you, in advance and as always, for your time – and your support for making Alberta’s health care system better. Last month marked the second anniversary of albertapatients and we're thrilled that so many Albertans have agreed to share their time, experiences and opinions with us. We're still growing toward our goal of connecting with as many people as possible and truly appreciate the effort that many of you have made to help us spread the word about this initiative. Please read on to the Did You Know section (below) for some details about the community that we found interesting: who albertapatients are, how people are hearing about us, the top three reasons for joining and some of the topic areas of most interest to members. More than 4,700 Albertans have joined albertapatients so far, with more signing up every day. Members live in cities, towns and communities throughout the province, and people of all ages are participating: the youngest member is 18 and the oldest is 90. Nearly half of members mentioned hearing about us through social media – particularly Facebook advertising and friends/family members commenting on or sharing our ads. 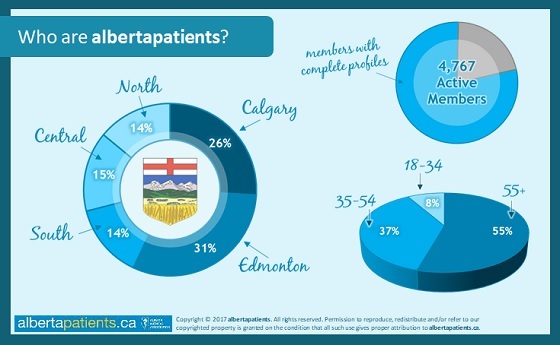 Another 27% of members first heard about albertapatients while searching the Internet or reading health-related websites and 14% were referred to us by a friend, family member or colleague who had already joined. 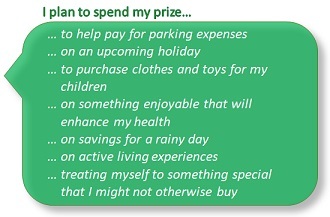 One in ten members read about us in a patient newsletter or communication from their local clinic or the AMA. When asked about the main reasons why they decided to join albertapatients, 83% said they want to help make health care better, followed by 70% who share an interest in health care and 58% who have a desire to share their views and experiences. 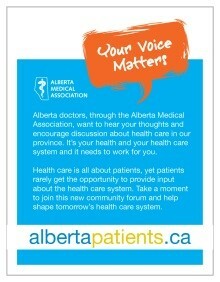 Members have expressed interest in discussing a variety of health care topics and prioritize them in different ways, but nearly everyone we have heard from agrees that the state of Alberta's hospitals, primary care/access to family doctors, access to specialists and surgeons, emergency services, and getting older in Alberta are topics of particular interest. Looking forward to the year ahead, we plan to give members more opportunities to share their views through surveys and activities (including a monthly health care tracking study) and continue to find and share health care-related information, opportunities and resources. As we send this newsletter, many Albertans are being affected by wildfire smoke from British Columbia. When smoke from a plant-based fire (e.g., forest fire, grassland fire) enters a community, it can often cause problems for the people who live there. The biggest health risk comes from small particles in the smoke. These particles can get in the eyes and respiratory system, which can cause burning eyes, a runny nose, coughing, or illnesses like bronchitis. If you have a heart or lung problem, these small particles can make it worse.